Blackbeard acquired his ship the way all good pirates get theirs. He stole it. 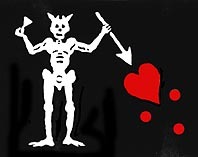 Blackbeard was sailing with Captain Hornigold in the Grenadines in November of 1717 when they came across a merchant ship that was flying the French flag. Hornigold in one ship and Blackbeard in another closed in on the merchant vessel from two directions, fired upon it and it apparently quickly surrendered. With the ship surrendered, Hornigold became the new owner of "Le Concorde de Nantes".. The ship was a French built "flute" from Nantes.. When Hornigold retired from pirating, he gave the ship to Blackbeard who renamed it "The Queen Anne's Revenge". The ship was recently discovered late 1996 in the shoals of the Beaufort Inlet at Beaufort, NC. Recovery has begun and expected to last several years. For more information click here for past press releases, here for pictures of recovered artifacts, or visit some of the Pirate Links. Click Here for the past news on the recovery of "The Queen Anne's Revenge" and research on the ship.